Forget Valentine’s day; February’s calendar highlight in the capital is Chinese New Year, with London offering the biggest celebration outside of Asia. Whether you want to join the throngs in Chinatown celebrating the Year of the Snake or enjoy a smaller event, the festivities have something for everybody. The Chinatown festival offers a combination of the traditional and the Western. Before heading to Chinatown though, there is the important matter of the "eye-dotting" ceremony in Trafalgar Square at noon on February 10. This entails the ritual painting of the eye of the Chinese lion in preparation for the lion dance to awaken the spirit of the lion. The parade moves from the square down to Rupert Street. For many, the "flying lion" dance in Chinatown is one of the most memorable events of Chinese New Year. The Soho streets will be packed with arts and crafts stalls and innumerable food stands for New Year. There will be a firecracker display and traditional Chinese musicians being joined by folk-rock acts such as Emmy the Great (who was born in Hong Kong, so has a connection), Paul Potts and Noah and The Whale. The fireworks display is at 5.55pm and the festivities continue throughout the evening. 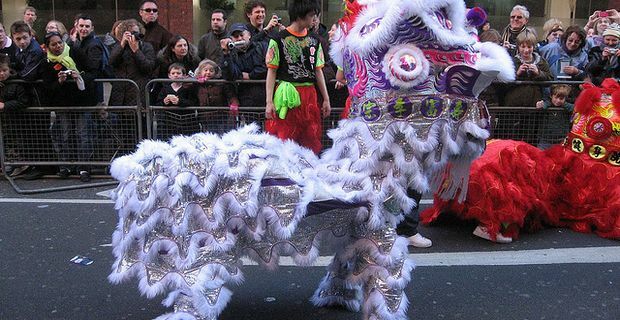 For those looking to give their kids a little cultural background on Chinese New year, the Museum of London in Docklands has several free events for children. An interactive storytelling session recounts the Chinese legend of the white snake. There are also opportunities to create New Year decorations and learn the art of Chinese watercolours. At the Cutty Sark in Greenwich there is a celebration of Britain’s links with China. A free event features music, workshops and performances, in addition to exhibitions showing how the sea trade brought Chinese inventions, culture, language and people to Britain.